The Mueller Report, biased media & Trump April 18, 2019, Season 1, Episode 10 Ray Hanania on Politics analyzes the media bias in the coverage of the release of the Report on Alleged Collusion with Russian by Donald Trump prior to and after his election as President. The Mueller Report was completed after a staggering 22-month long investigation by Special Counsel Robert Mueller that resulted in a finding that there is no evidence to support the allegations that have been made against the President. Podcast host Ray Hanania discusses the real problem and how national mainstream American news media bias is empowering President Trump and ensuring his re-election in 2020. For more information on Ray Hanania's podcast visit www.RayHananiaonPolitics.comor go to www.Hanania.comto get information on all of Ray Hanania's award-winning columns and writings. Remembering the 1979 election that changed everything in Chicago -- April 2, 2019 This is the "Ray Hanania on Politics" Podcast, a look at Chicagoland politics past and present ... 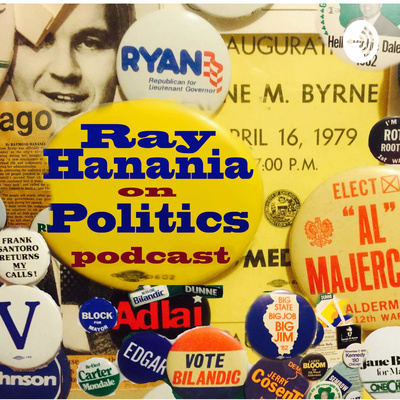 This episode of Ray Hanania on Politics looks at the 1978 campaign and 1979 Chicago Mayoral Election. We talk about the first African American mayor being either Lori Lightfoot or Toni Preckwinkle, but we can’t forget the action-paced newsmaking four year term of Chicago’s first woman Mayor Jane M. Byrne and how she defeated the Chicago Machine, and ended up taking it over … That was my first real election that I covered as a City Hall reporter and it was one of the most exciting elections Chicago had seen in a long time … Jane Byrne’s rise, her feud with the Cabal of Evil Men who were Ed Fast Eddie Vrdolyak, Ed Burke and First Ward Outfit alderman Fred Roti …her election challenge of Mike Bilandic, who took the office from Wilson Frost who was the President Pro Tempore when Richard J. Daley died on Dec. 20, 1976 … This is a look back at the rollercoaster first City Hall political earthquake that brought the Chicago Machine to its knees and changed Chicago politics forever … Jane Byrne’s rise opened the door to the changes that we continue to see today in Chicago politics. My mainstream columns are published at SuburbanChicagoland.com and in seven newspapers in the Southwest region of Chicagoland including The Regional News, The Reporter, the Des Plaines Valley News, and the Southwest News-Herald. My Middle East columns are published in the Arab News Newspaper, the Middle East Monitor online, and the Arab Daily News online. I hope you enjoy this episode of Ray Hanania on Politics. Go to RayHananiaOnPolitics.com for the latest episodes, or check us out on iTunes and my personal website www.Hanania.com.